AP DSC Notification 2018: Apply Online for 7,325 SGT, PGT, TGT & Other Vacancies: Andhra Pradesh Public Service Commission Released the AP DSC Recruitment 2018. As per AP DSC 2018 Latest News the AP Board has released the Notification to fill up the 7,325 SGT, PGT, TGT & Other Vacancies. This is the great opportunity for the candidates who are all looking for the AP DSC Jobs. The Online Application for AP DSC Notification 2018 will start from November 2018. The Exam will conducting on December 2018. Aspirants will get a sort of information like eligibility, selection, vacancy, application fee and AP DSC 2018 Exam Date in this article. In this 7325 posts, there are 3666 SGT, 1625 School Assistant, 452 Language Pandit, 441 PET, 556 TGT, 429 PGT, 77 Principal, 79 Drawing and Dance posts are the vacancies in AP DSC Notification. At a press conference held at Vijayawada on Thursday morning at 9 am, Minister Ghanta Srinivasa Rao will issue a notification for this notification. Disclaimer: The opinion mentioned here is purely from Manabadi experts and there is no guarantee on the analysis. We request you to take this analysis as informative purpose and not to come for any conclusion based on our analysis. Please wait for official information provided by the government of andhrapradesh. DSC and TET will be conducted seperately. DSC is conducted for filling up of teacher posts in Government Schools, Zilla Praja Parishad Schools and Mandal Praja Parishad Schools. 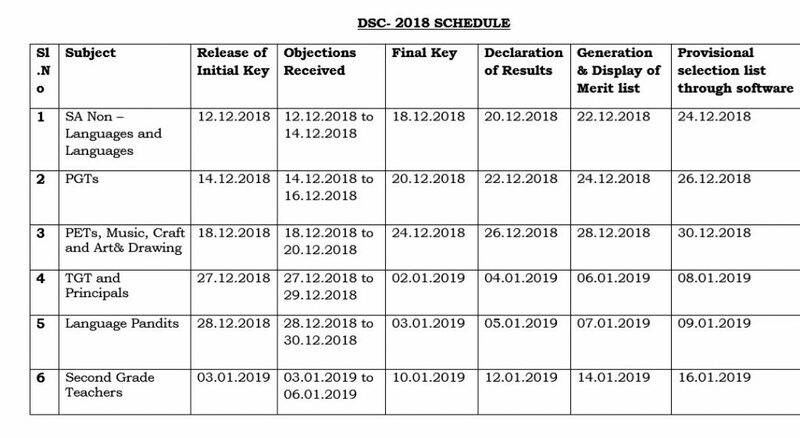 DSC exam will be conducted by District selection commission (DSC Board) constituted by the Government of Andhrapradesh. The actual (DSC) notification will be released by DSC board. **Physical Education Teacher should be filled with eligible meritorious candidates as per the Government Memo.No.1351/Ser.VI/2008-2, dated. 01.04.2008. **The number of candidates selected shall be equivalent to the number of vacancies notified. There shall be no waiting list and posts if any unfilled for any reason whatsoever shall be carried forward for future recruitment. It´s great news for those who are waiting for DSC Notification in Andhra Pradesh. Shri Nara Chandrababu Naidu, the honorable chief minister of AndhraPradesh has approved the proposal of recruitment of teachers in AP state through DSC or DSC Examination for the year 2018, said by minister shri. Ganta Srinivas. As per the data with DSE Board the total vacancies are 9250 posts primarily. Recently due to regularization and transfer of teachers in AP schools, the vacancy list may vary from 10,351 and will increases. As per the Information we have received these are the Vacancy list of Teachers in AndhraPradesh. DSC means earlier conducted by DSC board (District Selection Committee), an entrance exam conducted for the recruitment of teachers by the Andhra Pradesh state government. How and When to Apply for AP DSC? The Recruitment shall be through a selection process as decided by the District selection comission (DSC). Out of the Total Marks of , 20% weightage shall be for Teacher Eligibility Test (TET) score and 80% weightage shall be for DSC Exams score for all the posts, except for School Assistant (Physical Education) and Physical Education Teacher. Selection of candidates shall be on the basis of combined marks secured in the Main Examination to be conducted by the APPSC(80%) and TET (20%) in all categories of posts except SA (Physical Education) and PET for which selection shall be 100% based on the Main Examination conducted by DSC only. The important criteria to be eligible for AP DSC (SGT) recruitment exam is – the candidate must be qualified in AP TET recruitment exam with 60% marks for general category, 50% marks for BC & 40% marks for SC/STs. Candidates who wish to apply for AP DSC (SGT) 2018 in SGT category has to possess the above said marks in APTET Paper – I & candidates who wish to go for SA or Language Pandit should possess the marks in AP TET Paper – II. How to apply for AP DSC / DSC 2018? 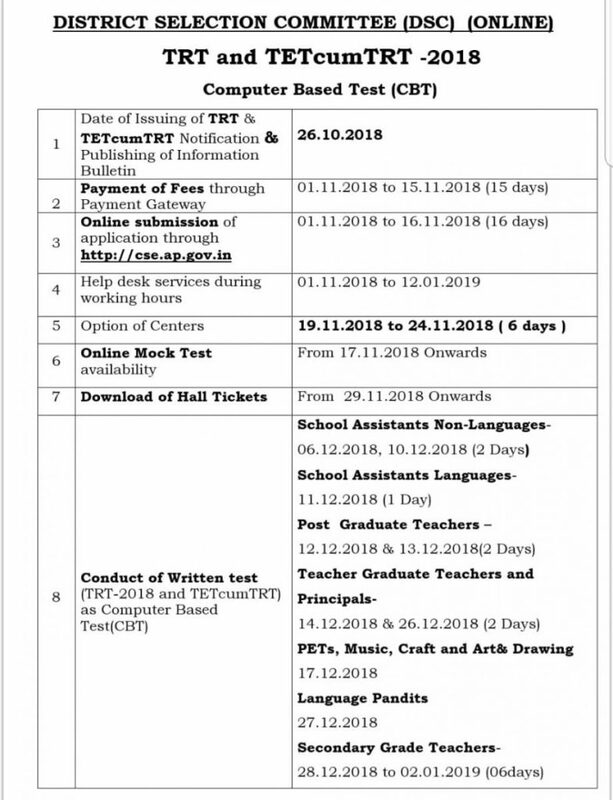 AP DSC / DSC (DSC) 2018 can be applied online through the official website www.appsc.gov.in. The application form for AP DSC / DSC 2018 exam will be available in www.appsc.gov.in under the recruitment category. It can be filled and submitted online itself. Each applicant must pay Rs. 200/- (RUPEES TWO HUNDRED ONLY) towards Online Application Processing Fee, each subject applied for. This apart, the applicants have to pay RS. 80/- (RUPEES EIGHTY ONLY) towards Examination Fee. However, the following category of candidates are exempted from payment of Examination fee for AP DSC Notification 2018. Important Note: BC’s, SC’s and ST’s belonging to other states are not exempted from payment of Application processing Fee and Examination Fee and they are not entitled for any kind of reservation. The Fee mentioned above is to be paid online through SBI ePay duly following online instructions once the application form details are submitted by filling APPSC ID, date of birth and other particulars. Scanned copy of your passport size photograph. Scanned copy of your signature. The following Certificates should be obtained from Govt. of AndhraPradesh (AP) State in prescribed proforma for the purpose of verification. Applicant must compulsorily fill-up all relevant columns of application and submit application through website only. The particulars made available in the website shall be processed through computer and the eligibility decided in terms of AP DSC Notification 2018. The applications received online in the prescribed proforma available in the website and within the time shall only be considered and the Commission will not be held responsible for any kind of discrepancy. Applicants must upload his/her own scanned photo and signature through J.P.G format. All the essential certificates issued by the competent authority of Telangana State shall compulsorily be kept with the applicants to produce as and when required to do so. Failure to produce the required certificates on the day of verification will lead to disqualification. Important: The claim of the candidates with regard to the date of birth, educational / technical qualifications, experience and community are accepted only provisionally on the information furnished by them in their application form and is subject to verification and satisfaction of the Commission. Mere admission to any test or interview or inclusion of the name of a candidate in a Merit List will not confer on the candidate any right for appointment. The candidature is therefore, provisional at all stages and the Commission reserve the right to reject candidature at any stage of the selection even after the advice has been made. How to upload the filled Application Form? The Applicants have to read the User Guide for Online Submission of Applications and then proceed further. The Candidate has to visit the WEBSITE www.apdsc.gov.in and fill the application according to the guidelines provided at the time of registering for applications on Website. While filling the application form, the candidates have to ensure that there are no mistakes in it. The Commission bears no responsibility for the mistakes, if any, made by the candidates. For any Technical problems related to Online submission and downloading of Hall-Tickets please contact (details provided shortly) (Call Time: 10.30 A.M to 1.00 P.M & 1.30 P.M to 5.30 P.M) or mail to helpdesk@appsc.gov.in. How to get ready to appear for DSC / SGT ? Once the DSC Notification 2018 for AndhraPradesh (AP) state is released you will be left with very little time for preparation. So prepare a Plan of preparation accordingly. Well it is the very common question for all aspirants. There are many institutes which provide training, but the thing which matters is how best you are extracting from them. You have to listen them carefully, prepare yourself notes and start getting prepared. We also suggest to go for DSC 2018 Online coaching even if you are going to training institute. So it’s better to have an online training class. With this Online training Classes you can hear the class at anytime, anywhere and pause and repeat the class whenever you want. Now the question is where you can get Online Coaching. We suggest you to go Manabadi DSC Online coaching. It is the best ap DSC online coaching 2018 in this Online coaching you can view video classes through internet. Even if you don’t have internet you can view videos through pendrive. The pendrive can be attached to your mobile. There are lot of books in the market. We suggest you to prepare telugu academic text books starting from 7th Class to 10th Class all subjects for SGT and 7th Class to Inter-2nd Year for School Assistant and Language Pandit. You can also tryManabadi’s DSC study material which is prepared by the best faculty with lot of research and point to point information removing the unnecessary things. Manabadi study material helps you what to read? and what not to read? Sir naku exam center vizag kavali kani vizainagar am ani type aindi change avutunda nadi local vizag online lo vizag type chesamu exam canter change valla local district maruthunda.